So first things first, I myself am not a coffee drinker, I known I know you can all flame me now. What's even worse is I am en emergency services worker on shifts which is totally unheard of for someone who doesn't "NEED" coffee. I unfortunately just do not have the pallet for it. However my wife loves her coffee and wants to upgrade from a basic pod machine to something with a bit more of a kick to it. Another baby is on the way and a new machine will help the whole stay at home and entertain visiting guests thing that comes with having a baby in the house. So I am totally out of my depth here in regards to what makes a good coffee and coffee machine. The wife has a very small amount of barista experience but that was over 10 years ago and I clearly have none. She is not great at keeping a workplace clean and can be a little lazy with maintenance. Hence why I am doing the research for this as it will be me doing it all. I am thinking of sending her to a short barista course as a birthday present to refresh the skills. I started to looking into full automatics but they really don't have good reviews for any one wanting a decent coffee. We have between $1500 and $2000 to spend. I was looking at the Breville oracle which is right at the top of that number, simply due it's apparent ease of use once "dialed in". The fact it comes with the white glove service of having someone come to your house to show you how to use it is also appealing. The horror stories of the longevity of them though is what has led me to here seeking some extra advice. I would already have one sitting on the kitchen counter if they had good reviews for lasting longer than a couple of years. Coffee habits for Sarah is probably 2 in the morning before work, one at home and one on the way "travel mug or something" and then on days at home maybe one more during the day. Coffee is always with milk "latte, flat white or cap". We would like to be able to entertain also so it needs to be able to make a few cups in quick succession on the odd occasion. Sarah likes her coffees hotter than most and the idea of being to steam milk at the same time appeals to her. Also we are in Adelaide South Australia. So once the machine is selected some advice on where to get good beans would also be appreciated. being able to pull and steam simultaneously from a non-breville machine will cost you 2k at least. if you really can’t stretch that far, forget the oracle, and go for a breville dual boiler and a macap m2m stepless. you’ll get great coffee from that setup. woodhouse and Caffeinator like this. yep definitely this if you’re happy to go used. Over the years we’ve used a few different machines but recently purchased the EM7000 Cafe Series Espresso Machine (sunbeam) and we can froth/steam milk while brewing the espresso. We are really liking this machine and it suits our needs. Grinder not 8ncluded, would need to buy one separately. I think you should both do the barista course. Good bonding, and if you are on cleanup, you may prefer cleaning up the mess as you go, rather than afterwards.. 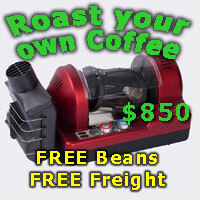 I was not a drinker of coffee either, started with a $30 800es, fresh beans from a local roaster, and a crappy grinder. You may suprise yourself how good it can be. I don't like milk and the associated coffee breath tho. Cheers for the responses guys. I had a look at the BES920 dual boiler, these mostly come new with a Breville smart grinder which from the looks of most posts here is almost capable of doing a mediocre job. I will have a search and see what comes up for the suggested Giotto and m2m stepless grinder. I have a bit of OCD and do like things to match eg brands and looks but will start with some of the suggestions. Cheers again. Plenty of good Adelaide roasters. Red Berry Espresso @ Glenside has been my go to roaster for years. Great range of single origin beans that grind cleanly as the roast doesn't extract much oil to surface of the beans.